Nearly 10-15% of patients with anomalous left coronary artery remain free of serious cardiac symptoms until adolescence or adulthood. This absence of symptoms may result from the development of an enlarged right coronary artery and/or collateral (extra) vessels originating from it that supply more of the left heart muscle with oxygen-rich blood than is usual. However, most of these patients will eventually develop adverse symptoms, such as heart palpitations, mitral valve regurgitation, chest pain resulting from exertion, dyspnea (difficulty breathing), a systolic heart murmur, or even sudden death. The presence of an anomalous left coronary artery may be suggested by an electrocardiogram (ECG), and detected by echocardiography (especially in children), or CT scan, though selective coronary angiography is necessary to confirm the diagnosis, especially in adults. After surgical treatment, left ventricular function may improve. The patient should be monitored carefully for insufficient coronary blood flow (ischemia). Occasionally, mitral insufficiency (leakage of the mitral valve) persists after surgery. This normally improves with time. However, if it is significant, a reoperation may be necessary. Complications may arise for those patients who were treated with the Takeuchi procedure. Obstructions to blood flow sometimes develop above the pulmonary valve or between the tunnel and its attachment to the left coronary artery, especially when performed in childhood. In other cases, a fistula (abnormal connection) may form between the tunnel and the pulmonary artery. Reimplantation of the left coronary artery or modification of the tunnel conduit area may be necessary to correct these complications. 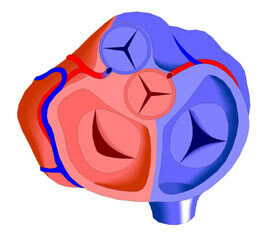 Coronary arteries reimplanted in childhood often become narrowed over time and require close follow up.